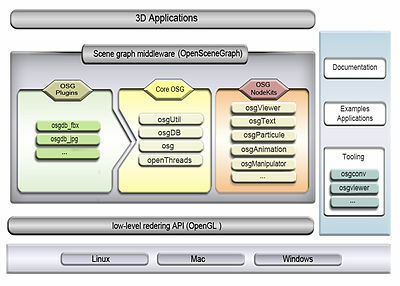 OpenSceneGraph is an open-source 3D graphics application programming interface, used by application developers in fields such as visual simulation, computer games, virtual reality, scientific visualization and modeling. The toolkit is written in standard C++ using OpenGL, and runs on a variety of operating systems including Microsoft Windows, macOS, Linux, IRIX, Solaris and FreeBSD. Since version 3.0.0, OpenSceneGraph also supports application development for mobile platforms, namely iOS and Android. The OpenSceneGraph project was initiated by Don Burns in 1998. Robert Osfield joined the project during 1999, working on porting finished components for Microsoft Windows. The project went open source in September 1999 and the official project website was created. Towards the end of the year Osfield took over the project and began extensive refactoring of the existing codebase, putting emphasis on modernisation, embracing modern C++ standards and design patterns. In April 2001, taking into account growing community of users and interest of public, Robert Osfield created OpenSceneGraph Professional Services, providing commercial support, consulting and training services. This marks full professionalization of the project. The first official stable version of OpenSceneGraph was version 1.0, released in 2005. An extended version 2.0 followed in 2007, adding support for multi-core and multi-gpu systems, several important NodeKits and usage of unified multiplatform build system CMake. Books and user handbooks were introduced. The project has been quickly growing and becoming more popular ever since. There are more than 530 contributors signed under current stable version, and the official mailing list contains thousands of names. Overview of the openscenegraph architecture. Integrated FFmpeg support for displaying video file content in 3D applications. New osgQt library that makes it straight forward to integrate !OpenSceneGraph with Qt, including web browsing via QWebKit. Library architecture can be separated into three main subsets — the core OpenSceneGraph library, osgViewer and a set of NodeKits. The base of OpenSceneGraph library can be further divided into four main modules. The core of OpenSceneGraph provides classes and methods for construction and manipulation of the scene graph. It contains classes representing various types of nodes, scene geometry, OpenGL state abstraction, geometric transformations, as well as mathematical classes for 2D and 3D vector and matrix operations. Advanced memory management is also included. The OpenSceneGraph project contains a threading library, OpenThreads, which is a lightweight cross-platform thread model. It is intended to provide a minimal and complete Object-Oriented (OO) thread interface for C++ programmers. It is loosely modeled on the Java thread API, and the POSIX Threads standards. The architecture of OpenThreads is designed around "swappable" thread models which are defined at compile-time in a shared object library. It is of importance to note that while a factory pattern design could have been used to achieve the goal of generic interface, it would have required the programmer to allocate each of the 4 fundamental types (Thread, Mutex, Barrier, & Condition) on the heap. Due to the cost associated with heap allocation of the underlying concrete implementations of these constructs on some platforms, such allocation was deemed unacceptable at the time this library was originally written, and thus the factory pattern was not used. Instead, a somewhat abstruse - but effective - technique was chosen to provide the necessary data/implementation hiding. This technique uses private void pointers to encapsulate object private data. The void pointers actually point at concrete data structures, but give a uniform interface to the dso. The design goal of OpenThreads is to construct optimized implementations using platform optimized multi-processing constructs such as the sproc methods used on IRIX, and Windows threads. osgUtil contains rendering backend functionality and utilities taking care of scene graph traversal, rendering optimisation and transforming the scene into a stream of OpenGL calls. It also provides means of basic interaction with scene, such as object picking. OpenSceneGraph also comes with a large collection of database loaders and many 2D/3D data formats manipulators. More than 50 different formats are supported - most common 3D data formats, such as COLLADA (.dae), LightWave (.lwo), Wavefront (.obj), OpenFlight (.flt), 3D Studio Max (.3ds), DirectX (.x) and many others. OpenSceneGraph also provides its own native ASCII .osg format. There are exporters into .osg format available for Blender, Maya and 3D Studio MAX. Supported picture formats include .rgb, .gif, .jpg, .png, .tiff, .pic, .bmp, .dds, .tga and quicktime. This module also provides I/O device abstraction. osgViewer Library provides a quick and easy way of visualizing the graphics scene. It is also a platform-independent abstraction for various window system interfaces. osgAnimation — Skeletal models usage, animating and morphing. osgFX — Special effects and image postprocessing. osgManipulator — Interactive 3D scene manipulation. osgParticle — Advanced particle system usage. osgQt — Integration with Qt toolkit and incorporation of QtGUI elements into OSG applications. osgShadow — Framework for shadow rendering techniques. osgTerrain — Extensive terrain rendering. osgText — Quality antialiased fonts, TrueType and FreeType font support. osgVolume — Volume rendering and volumetric data manipulation. osgWidget — Simple GUI creation. OpenSceneGraph doesn't provide any functionality for higher "gaming" logic, it is a rendering-only tool. There are several full-scale engines for computer games (or so-called serious games) creation using OSG as a base of graphics rendering, the most common framework being Delta3D. There is a great variety of software products built on top of OpenSceneGraph; among others, Virtual Terrain Project and ViewTec TerrainView. List of OSG users contains companies as Boeing, NASA, FlightGear, Norcontrol and many others. ^ Martz, P.: OpenSceneGraph Quick Start Guide. Louisville, USA, 2007. ^ Torres, Jordi. "OpenSceneGraph 3.0 release". www.openscenegraph.org. Retrieved 2017-09-23. ^ User, Super. "OpenSceneGraph 3.2 release". www.openscenegraph.org. Retrieved 2017-09-23. ^ User, Super. "OpenSceneGraph-3.4 release". www.openscenegraph.org. Retrieved 2017-09-23. ^ User, Super. "OpenSceneGraph-3.4.1 release". www.openscenegraph.org. Retrieved 2017-09-23. ^ User, Super. "OpenSceneGraph-3.6 release". www.openscenegraph.org. Retrieved 2018-08-14. AlphaPixel OSG Binaries - Windows, Mac and Linux x86 and x64 precompiled binaries.